One of the most “charismatic megafauna” of the Missouri River doesn’t really belong there. Actually, there are several species of recently introduced asian carp that are changing the ecosystem of the river. Throughout the Mississippi River watershed, and now potentially the Great Lakes, “Flying Carp” have been flopping their way into people’s boats and all over You-Tube. But much of the havoc they are wreaking is under water. 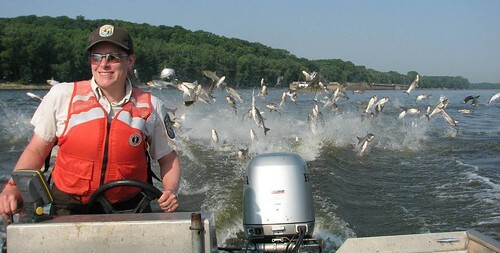 USGS biologist Duane Chapman has been on the front lines of the asian carp invasion across the world. He joined us for an update on what is being learned about these new big river inhabitants and their effects on our rivers. The two latest asian carp species to invade the Missouri River, the silver carp (Hypophthalmichthys molitrix) and the bighead carp (Hypophthalmichthys nobilis) are both important aquaculture species in China. Both were introduced to North America to clean algae in aquaculture ponds and quickly began to escape. The floods of 1993 and 1995 spread the species throughout the Mississippi River basin and beyond. These filter feeders are having profound impacts on the food chain in our rivers. In some locations in the Illinois River they are estimated to compose more than 80% of the biomass. And when the silver carp get jumping, they’re impossible to ignore. From the basics on carp biology to the latest efforts in commercial fishing and keeping the carp out of the Great Lakes, we were lucky to get an update on the asian carp invasion from Duane Chapman of the USGS. USFWS biologist Pam Thiele trails a fountain of silver carp on the Illinois River. photo courtesy of the US Fish & Wildlife Service. Before the presentation, folks had an opportunity to take a short hike on the Katy Trail with Quinn Kellner, natural resources manager of Ted and Pat Jones Confluence State Park.